Following successful runs at the Fumbally Exchange and the Workmans Club in Dublin in 2011, the Traces Of The Real exhibition will open at Plugd at the Triskel Arts Centre in June. 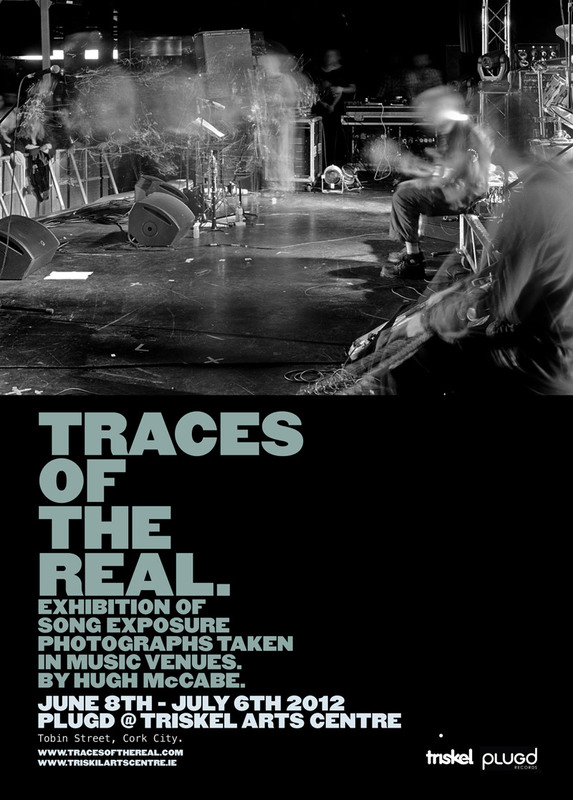 Traces Of The Real is an exhibition of song exposure photographs taken by Hugh McCabe in various music venues in Ireland and the UK. 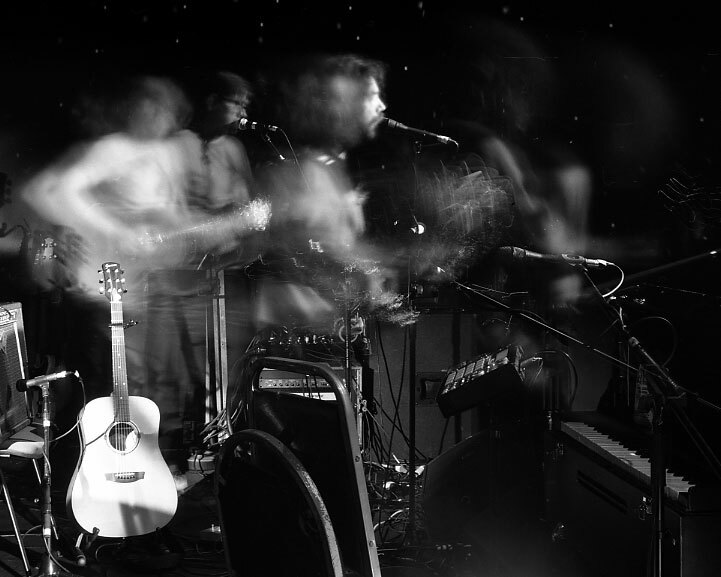 A song exposure photograph is a photograph of the performance of a song, created by opening the shutter at the start of the song, and then closing it at the end. The resulting images capture the stages and equipment in vivid detail but cast the performers and audiences as fluid, transient and ghostlike presences in front of the lens. The aim of the series is to explore the notion of temporality within photographic representation, and to question the idea that photographs should correspond to discrete, frozen moments in time. The inspiration came from renowned Japanese photographer Hiroshi Sugimoto’s Theaters series. Sugimoto set up his camera at the back of ornate movie palaces in New York and other US cities, opened his shutter at the start of the film, and closed it at the end. The light from the projected movie becomes the light source for the photographic exposure and illuminates all corners of the theater. Traces Of The Real started as an exploration of how this idea could be applied to live music concerts and evolved into an attempt to answer the following questions. Can one take a photograph of a song? If so, what would it look like? The photographs were shot in a number of different venues: including Vicar Street, The Village, The Button Factory, Whelans (all in Dublin); Triskel Christchurch (Cork) and ATP (Minehead, UK). 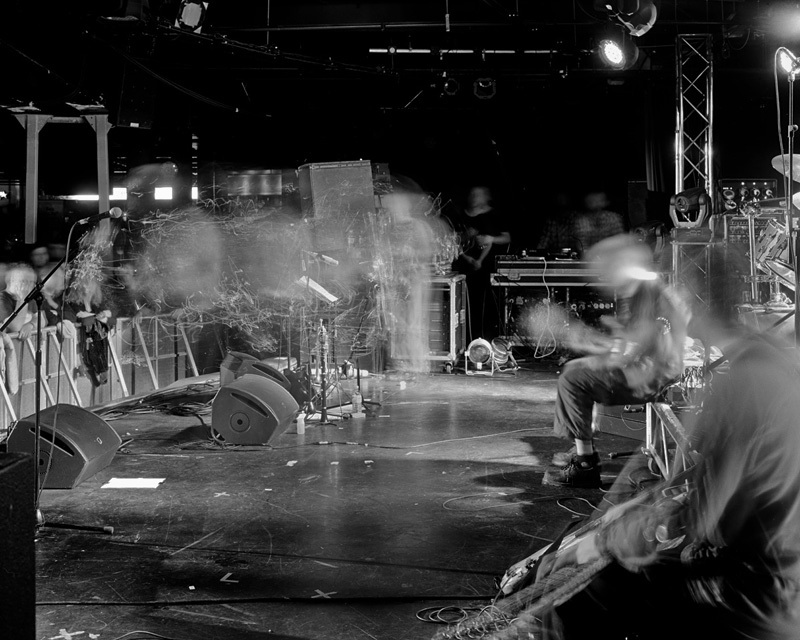 A wide variety of artists were photographed in this manner: including Adebisi Shank, Spook Of The Thirteenth Lock, The Ex, Si Schroeder, Jello Biafra, Dan Deacon, The Silver Mt Zion Memorial Orchestra, The Gloaming and many more. The images are created using a mix of old and new technology. They are shot using a large format film camera fixed onto a tripod. This produces a 5” by 4” negative which is digitized to give an image of enormously high resolution. These images are then printed by fine art printer David Monahan and mounted onto aluminum compound (dibond) panels. Traces Of The Real will open in Plugd on Friday June 8th and run until the beginning of July. Hugh McCabe was born and lives in Dublin. He has spent more than fifteen years involved in the music scene, mainly as a musician but also releasing records and organizing gigs, before turning to photography in recent years. He completed the Certificate in Photography and Digital Imaging at NCAD in 2010 and is currently a participant on the MA Art In The Contemporary World (NCAD). He has participated in a number of group exhibitions. Traces Of The Real is his first solo exhibition. He lectures in Creative Digital Media at the Institute of Technology Blanchardstown.